Lately I can't help but look up interesting and innovative classroom designs. I find myself wanting to step away from the front of the classroom more and more. The problem is that my traditional chairs-attached-to-desks classroom furniture holds me back a bit. I took this pic during a directed study. 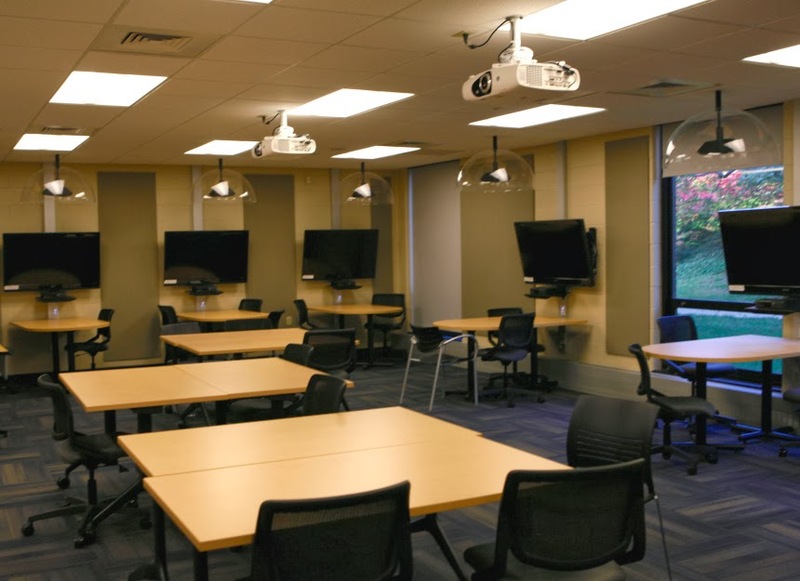 Desks can be moved around to form groups, but they are still the traditional institutional desks and give the classroom a certain sterile feel. Students in small groups with devices. Also, the fact that there is only one big screen at the front of the room makes the teacher the de facto center of the universe. Example of my daily class agenda. 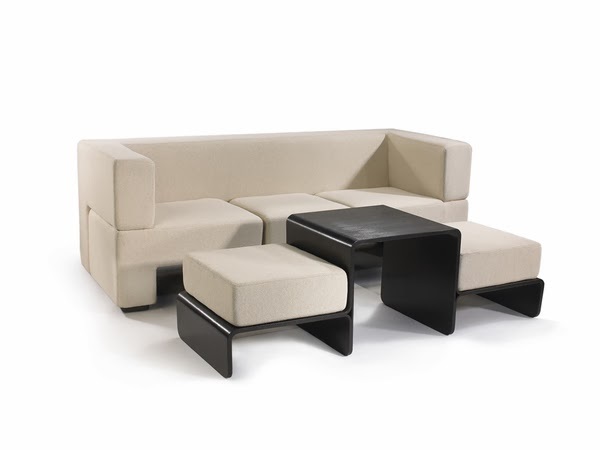 The chairs look comfortable and the tables are big enough to fit laptops and mobile devices. 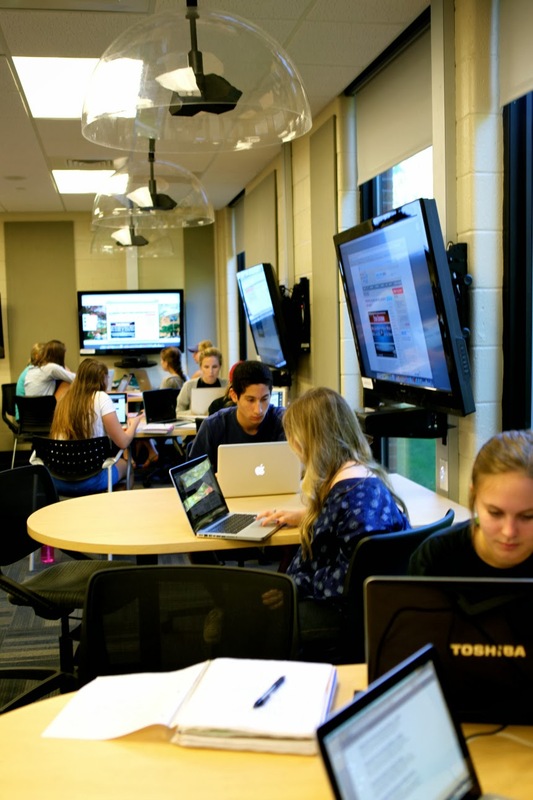 Also, students can share their screens, and therefore their ideas on the flatscreens at each station. The cones of silence above each station allow students to share sound without disturbing other stations. It would be easy for a teacher to move through the classroom and see what each group of students is doing collaboratively. Seeing students at some of the stations working together on various devices and sharing their ideas on the screens gets me even more excited! I like that the chairs, tables, and screens are on wheels in this model. 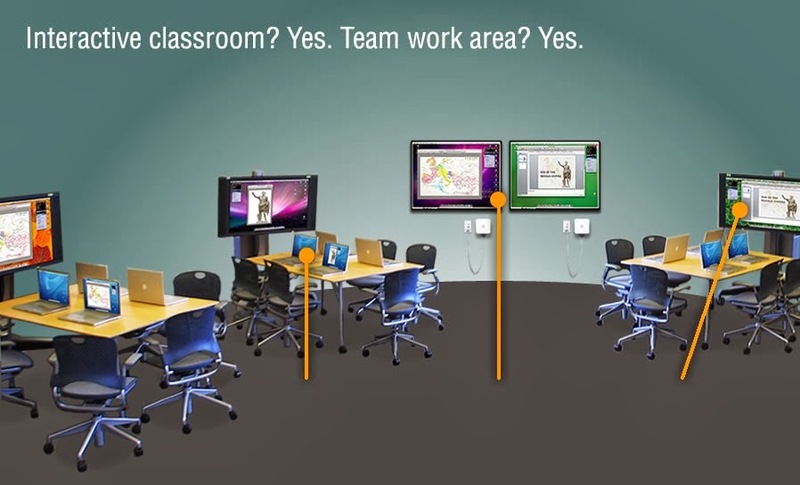 This means collaborative station locations, and the number of students in each group, could be more easily changed according to student learning needs. I like this furniture. It seems more comfortable than your average table and chairs. It might be too big for my classroom, but more comfort for students could lead to more natural collaboration. If they feel like their sitting around in someone's family room rather than in a sterile classroom, I think conversation will flow more freely. When slotted, the table acts as a console. When freed, it acts as a coffee table. 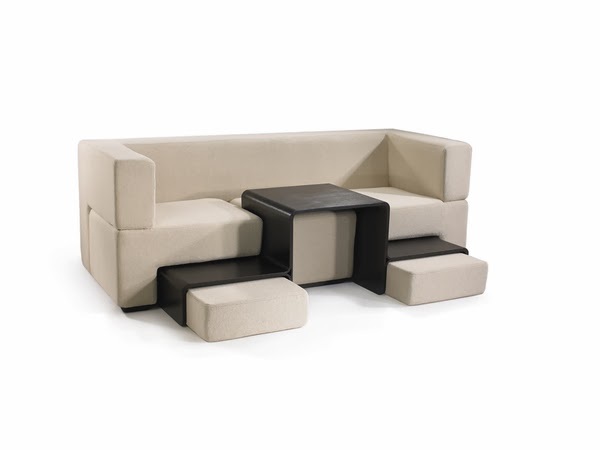 The magnetically retained sofa cushions always find and keep their optimal position either atop the table for an ottoman or below for a coffee table. What if the furniture was more convertible? 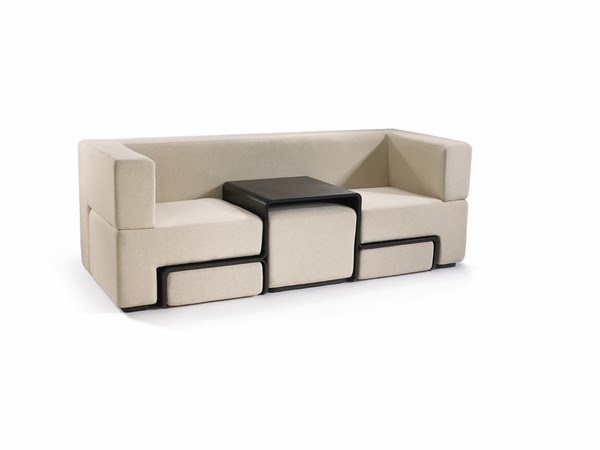 The Slot Sofa can take many forms. It fits my comfort guidelines, but also could be rearranged according to what students decide they need. No matter what my ideal classroom would be, it won't do any good for kids unless they have input. I really like this article, with videos, about how a design team helped solve a middle school math teacher's space problems. The first video explains how the designers took both teacher AND student needs into account. The second video has more about the physical rebuilding process and how the teacher was an important part of that. The final result is great and creates more space and more areas where learning can happen. I also like that much of the furniture was repurposed. Perhaps something I could look into doing to save money on a big project like this. As I mentioned earlier in the post, I'm a teacher. I'm not a designer. I would definitely need help from professionals to make the best use of my space so that my students' learning and collaboration needs were met. The Third Teacher + is the group profiled in the 3 part video series above. Another group I've looked at that seems promising is Learning Space Toolkit. Others I'd love to consult would be Malcolm Brown of Dartmouth College and Philip Long of MIT. 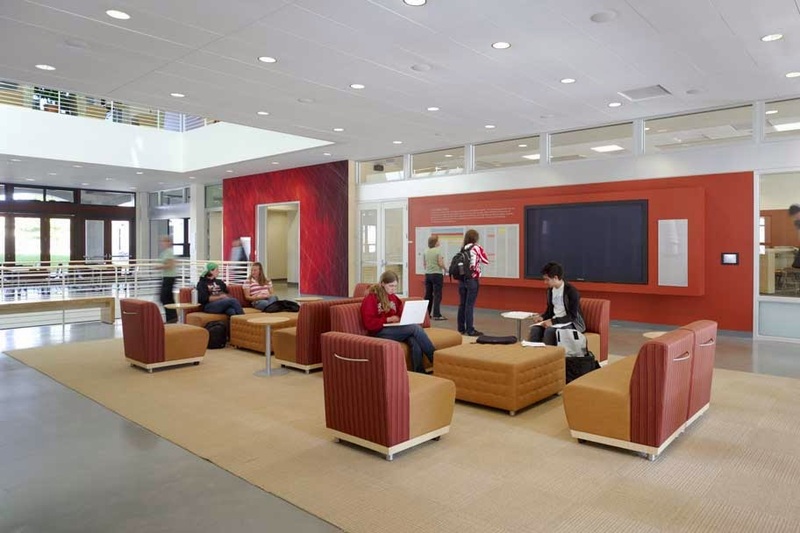 They've studied trends in classroom design and why some designs are better for learning than others. I know I'm dreaming big and much of this would require a big budget, but a vision has to start somewhere. I'll keep trying to get creative in my classroom and I'll keep you posted! How am I supposed to keep calm when I haven't given one single test yet this year? I'm required to give a semester exam. What would an exam look like for a class in which students have not been tested? I have not required my students to memorize anything, but I have required them to research everything. I have not required my students to answer multiple choice questions with clear right or wrong answers, but I have required them to justify their varying opinions. How the heck would I create a semester exam that fit the standard I've set? I wasn't the only one with these questions racing around in my head. Parents posed these questions to me throughout December parent conferences. At least 6 or 7 different students raised their hands and asked about the exam in the weeks before winter break. My answer was, "I have a few ideas but I haven't finalized anything. I'll let you know with plenty of time to prepare." 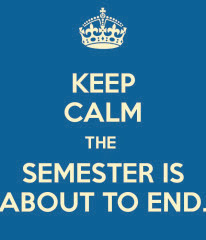 · Our class Edline page and any documents, video clips, class notes, or other resources that are available there. Since you will be writing 3 essays in 2 hours, you will need the entire time to write. All research and outlining should be done BEFORE the exam or you will run out of time. · A thesis statement that turns the question around AND answers it generally. · ALL terms/ideas listed with the question included in a way that helps answer the questions and demonstrates understanding of the terms/ideas. · A concluding sentence that reviews the main idea of the short answer. 1. What was the Renaissance? Why did the Renaissance start in Italy? 2. Why did Niccolo Machiavelli write The Prince? What is the main idea of The Prince? 3. Explain Martin Luther’s reasons for choosing to speak out against the Roman Catholic Church. How did the Roman Catholic Church react? 4. How did a desire for spices and the introduction of new navigational inventions encourage Europeans to start exploring? a. How did people use spices? b. peppercorns – Use them as an example to explain how spices were treated as a valuable commodity. 5. 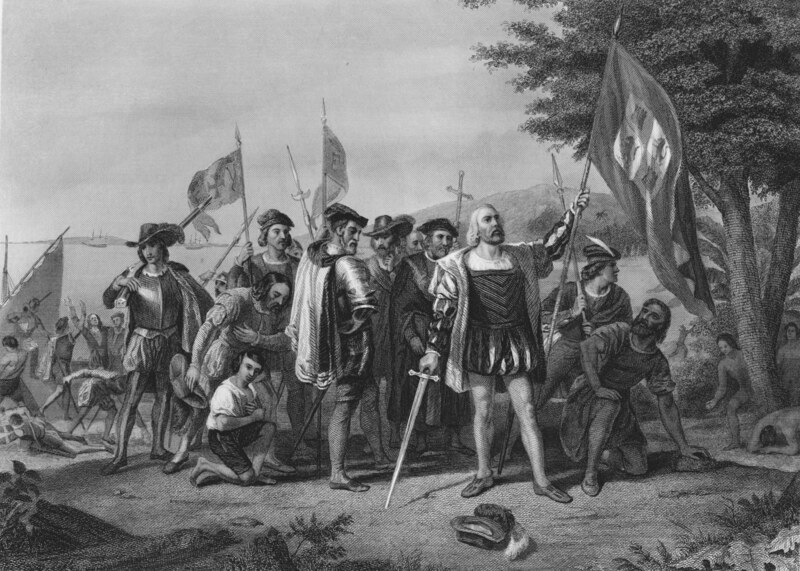 What does the image below show about the traditional reputation of Christopher Columbus in American history? What should his reputation in American history be instead? c. Coat of Arms – What did Columbus think of his own accomplishments? 6. How do we know that Spanish explorers and missionaries did not view Native American civilizations as civilized people? 7. How does the real story of Pocahontas and the Jamestown settlers differ from the Disney legend from the movie? d. John Smith’s differing accounts: Why do they differ? 8. Was the Massachusetts Bay Colony really a “Model of Christian Charity” as John Winthrop said it would be? a. Why did the Puritans move from England to Massachusetts? I felt good about it. Once I was ready to present my new idea to the students, I posted the exam guide to my website and sent home an email to parents to update them as well. Not every parent has bought into my new-fangled teaching methods, so a small part of me was bracing for some critical emails. Instead, this is what popped up in my inbox less than an hour after I posted the exam guide. The exam is reflective of the subject matter students have been learning and the work they have been doing. It calls on students to be responsible for the subject matter that has been covered. It requires that the students be thoughtful and prepare for the evaluation. If students plan appropriately, they have been given sufficient time to prepare for the evaluation without excessive work load. The evaluation is not set up so that in order to do well, they have to cram and remember/memorize information. They will be utilizing skills that are reflective of skills necessary for succeeding in life beyond the classroom. I'm so fortunate to have parents who take the time to write positive thoughtful messages to me. It meant a lot and it gave me the energy to continue pushing forward in my mission to make learning, not high test grades, the focus of my teaching.